You can tell Simon Sinek’s book Start With Why has been out for a while because his stories and analogies are a few years old. But the book itself is absolutely timeless. It really forced me to think about the future of what I do and what my role is in Functional Movement Systems. Our work in Functional Movement Systems in representative of this ‘why’ approach, as is the way our group has approached the SFMA with the medical community, in some of our work with Greg Rose at Titleist and in the kettlebell work we’ve done. It explains some of the things we did right, but also challenges us to do some of those things better. Here’s the premise of the book: Start what you do with why. You may think that’s easy to do, but it’s not. After I listened to the book a couple of times, I tried to come up with an overview of why Functional Movement Systems exists. Why did we develop the Functional Movement Screen? Why did we develop the SFMA? Why was I absolutely blown away the first time I saw the Y Balance Test Phil Plisky developed? It really goes back to the nature of our business. Functional Movement Systems isn’t a corrective exercise company. It’s not really even a testing company. We were a bunch of guys a long time ago in a physical therapy and training clinic in the small town of Danville, asking ourselves what we could do to be better. We were studying, reading books and taking workshops. We don’t live in a major market; we don’t have a big university. But we can still think outside the box. We can still use our brains. We can still apply logic. We realized the fitness and rehabilitation models weren’t as good as they could be. Sure, we were learning to measure things more precisely, but what if we were measuring the wrong things? Advances in medicine often give us a clearer or more magnified view of a situation, but what if we’re looking at the wrong situation? The Functional Movement Screen gave us a tangible thing we were missing. People looked like they moved pretty well playing sports or when we watched them do rehabilitation. But when we put them through this little movement screen, we discovered sometimes that movement wasn’t very good at all. Sure enough, the people who had movement problems didn’t learn exercises quickly and seemed to show up in our clinic more often with injuries. It’s as simple as that. We didn’t have a bunch of research dollars thrown our way. We just started asking lots of questions. Really, we made the assumption. We had the hypothesis: The world is looking at movement incorrectly. Our ‘why’ statement—why do we exist, why are we here, why are we exploring this model—was and is this: We want to change the way the world looks at movement. If that turned out to be coming up with better programs, it would have been fine. That’s what a lot of people were doing then. People had a gut feeling that what we were doing wasn’t enough. Many people went into the program-design business or tried to develop a piece of equipment without going back to the start, the idea that maybe not everyone needs the same program or the same piece of equipment. I wanted to change the way the world looks at movement, but I wasn’t ready to pre-package a magic-bullet program or try to design a new product. Maybe the reason people weren’t doing as good as they could was because everybody was following a general program, one that’s not individually specific. I was also disheartened going through physical therapy school. People knew a lot about exercise, but not much about the way human movement learning occurs. They were experts in exercise, but they weren’t experts in the way the brain and body learn to move. If you’re really good at making pastry but the people you’re serving don’t eat pastry, you being a pastry chef doesn’t really benefit them. It’s just not what they need. It’s what you’re good at, but maybe what you’re good at doing needs to change. We gauge our profession around the exercise physiology goals of movement, and not the behavioral goals of movement. Simon Sinek in Start With Why tells us we have to define why we’re doing what we do. From there, we have to develop how we’re going to have our influence…and then what ends up being the product of that. He looks at very successful visionaries and shows us that while the competition was trying to copy their ‘what,’ the competition didn’t have the ‘why’ and didn’t have the ‘how’ of the development. In many of the things we do when looking at movement—whether it be in medicine, rehabilitation, performance enhancement or fitness—we’re missing something. Of course, not everything is wrong. Some of the things we’re doing are great, but we’re missing something. We’re jumping straight to specialized testing or performance testing without setting a movement baseline. That’s a big problem when you’re trying to change the way people move—and all of us to some degree are trying to change the way people move. Functional Movement Systems is not a screening company. We’re not a testing company. We’re not even an exercise company. We’re a company committed to giving you actionable steps to help people move better. The first thing you have to do is find out how they’re moving. Set a baseline, and then use the best tools you have to change that baseline for the better. Look at the kind of professions we depend on that protect and save lives. Look at paramedics. Look at pilots. Look at surgeons. These professions use a standard operating procedure and they follow systems. It doesn’t mean pilots, paramedics and surgeons are stupid. It’s just the opposite. It means they’re smart enough to follow a system and a standard operating procedure for about 80% of the day. The other 20% becomes the curve ball. Then they’ll think outside the box, but only after following a standard operating procedure and the systems developed through history. Fitness doesn’t really run like that. You may think that’s not true. But what if we had a camera on the wall to watch your new clients? They’d be on the same equipment, getting the same instruction with little or no assessment. I don’t think that’s going to be the way we do things 10 years from now. You can change early or you can change late. We need more standard operating procedures, fewer programs and more systems. I have no idea what I’m going to do with a client until I meet the person. Each test I do provides actionable things to tell me whether I need more tests or if I can start programming with the information I have. The first thing I would do is kill all the tests that are wasting your time and not giving you direction, and only leave you with one test at a time. That test will tell you whether to program this, or whether you need another test to better define the problem. That’s the way we’ve stacked our information because it’s the best way to do it. If we look at professions more evolved than we currently are in fitness, rehabilitation and performance, that’s what they do. If we’re going to get better, we have to do the same thing. Why? Because we want to change the way the world looks at movement, thinks about movement and tries to change movement. There are natural principles the mind and body follow when it’s time to move. This is true when we move the first time, and it’s true when it’s time to move after an injury, when we change our training or change an activity. The brain and body follow these principles, but if you don’t know them, it’s going to be very hard to program somebody to maximize the benefits of the time they dedicate to training. The 10 principles are in the back of the Movement book, and I expanded on them here If you disagree with the principles, that’s fine, but I think you’re going to find there’s a lot of evidence for them. These aren’t my principles. They’re principles I tried to define to give you action points. The principles are listed in order, meaning if you disagree with the first one, the other nine won’t matter. We’re on different paths. Go do your thing and I’ll do mine. You have to have some agreement with all 10. If you don’t understand one, that’s okay. But before you disagree with it, make sure you understand it. Our systems and our standard operating procedures are not based on my opinions. They’re based on these 10 principles. 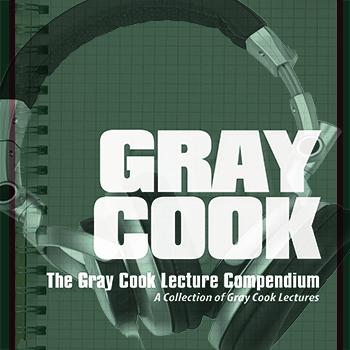 The way I choose to address these principles are very Gray Cookish. There are many ways to address programming and exercise to follow these principles yet do something a little bit different. These are just methods, and different methods are okay as long they don’t step on a principle. However, if your methodology does something that disagrees with the natural principle of biological movement learning, you might want to change the method before stepping on the principle. You’re not going to get what you want. What we developed was a little movement screen, the FMS. It’s not a performance test; it’s just a screen. We adopted the Y Balance Test to look at upper- and lower-quarter asymmetries. We have a medical movement screen, the SFMA, because the very first principle is to separate pain from dysfunction. If you have pain on a movement screen, you have a medical problem. Don’t ask for a fitness solution. The next time you’re doing your ‘what,’ ask yourself ‘why’ and see if your ‘how’ is a correct way to do it. I’ve pulled some reps on this and because of that I feel even more confident in our model and some of the future work I’m going to do around it. The book that helped me articulate this for you was Start With Why by Simon Sinek.